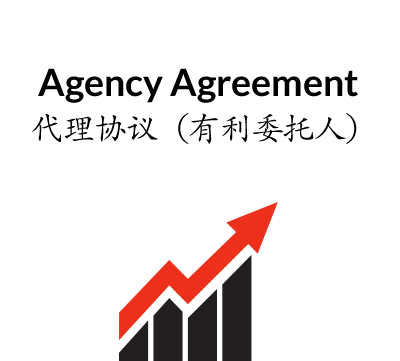 This dual language (Chinese–English) agreement is for use where a manufacturer or supplier appoints an exclusive distributor or re-seller for the sale of its products in a defined overseas territory. Here the distributor buys on its own account for re-sale – unlike an agent who sells on the principal’s behalf. This Agreement contemplates that a manufacturer or supplier in one country will appoint a Distributor of its goods in another country for the resale of those goods in that local market. The Agreement contemplates a fixed initial period which may be subject to renewal. 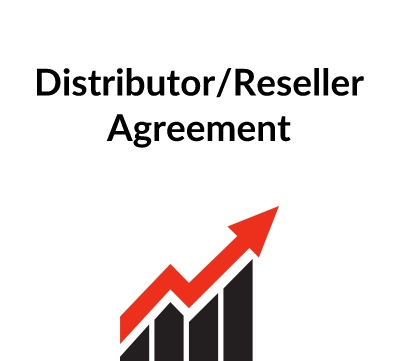 A Distributor buys for resale and each order placed by the Distributor will constitute a separate contract. Unlike an agent, a Distributor is selling on his own account and not on behalf of the Principal. Both parties will nonetheless want to be sure that the Distributor has adequate information and literature concerning the products as well as having a workforce capable of handling sales and any after-sales or maintenance which may be required. Since this is a cross-border agreement – i.e. each of the parties is in a different territory with different laws – it is important that the Distributor has the agreement checked by lawyers in the Principal’s country – and vice versa. In some Gulf States, for example, the law does not recognise a distinction between a distributor and an agent and a distributorship agreement could be subject to local agency law and in some circumstances the agreement may be registerable and governed by the local law whatever the document itself may say. Specific comments on the template are set out below. This is the date upon which the Agreement is executed – not necessarily the date upon which it comes into effect – which is dealt with in clause 2.2. Here set out the full name of each of the parties and the official address of that party. If it is an English limited company, this will be the registered office. This is self-explanatory and briefly introduces the Agreement. We have inserted 4 definitions including that of the territory which needs to be defined. The territory may cover a complete country, part of a country or more than one country, but whatever the case, be sure to define it precisely – do not, for example, say “any country in South East Asia” since there could be an argument as to what is meant by the South East Asia. 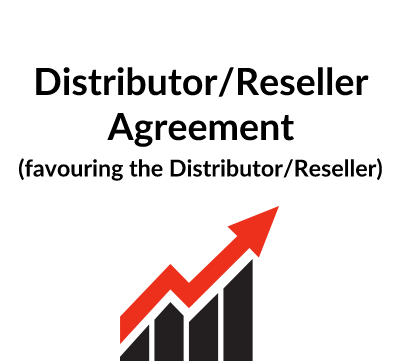 The Distributor often wants a larger territory than the Principal, but should beware of taking on too many territories which it cannot control, (particularly if the Principal insists on minimum sales quantities being met). Products need to be clearly defined. The Principal may try to appoint different distributors for different products, whereas the Distributor may want the right to sell as many different products produced by the Principal as he can. 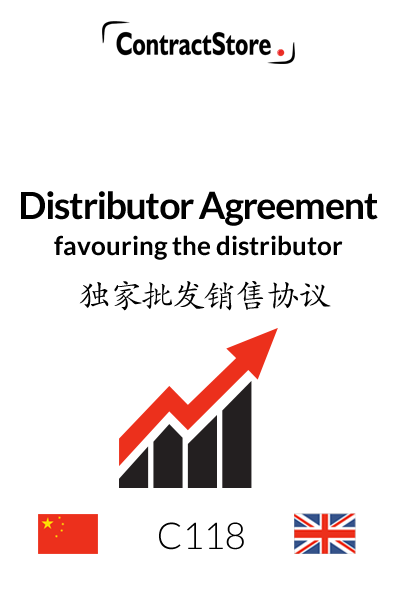 The Agreement states that the Distributor is being appointed on an exclusive basis. Clause 2 makes it clear that the Distributor is able to sell/distribute products that differ from the Principal’s Products. This is deliberately wide and it is possible that the Principal may wish to clarify/limit this provision. In clause 2.2 the date upon which the Agreement comes into effect should be stated as well as the initial period – say 2 years. If notice of renewal is required, clause 2.2 might say that it will expire at the end of the initial period “unless it is renewed by agreement between the parties at least 3 months before the expiry date”. This clause sets out the arrangements for ordering and includes provision for the Distributor to give the Principal estimated requirements in advance so that he can plan accordingly. Clearly, the precise details of this clause will need to be tailored to the particular arrangements in place within the relevant organisations. Clause 3.3 makes is clear that each sale constitutes a separate order for goods. Each order may be governed by Principal’s standard Terms & Conditions of Sale or (as stated here) Distributor’s Terms & Conditions of Purchase, or perhaps an agreed set of conditions will be developed. It may be sensible to state that a copy of the agreed terms is annexed to the Distributorship agreement so that there is no doubt as to terms which are to be incorporated. Clause 3.4 gives the Principal the right to modify products and to change product lines but advance notice is required. Clause 4.1 assumes that the standard list price of the Principal will apply to all sales but there may be some pre-agreed discounts, in which case the words in square brackets at the end of the clause should be incorporated in the document. It is not uncommon for the discount to be referred to in an appendix to the Agreement. Clause 4.2 deals with additional payments over and above the list price which may be payable. Clause 4.3 provides for payment to be within a specified period. (A Principal is likely to require payment on a letter of credit but we have not specified this in this version of the Agreement. See, by contrast, Document A117). Clause 4.4 deals with currency and this need to be specified here. Clause 4.5 makes it clear that the Distributor is responsible for all charges and customs clearances at the port of arrival. The list of obligations is fairly general and reasonably self-explanatory (Document A117 contains a more comprehensive list of obligations on Distributor). Clause 5.4 assumes that the Principal will arrange for visits to the Distributor’s territory from time to time – from a commercial point of view this is certainly to be recommended. This clause contains a number of obligations on Principal with respect to marketing literature, training, technical support etc. It is usual for a Principal to try to protect its IP rights and such a clause has been included here. 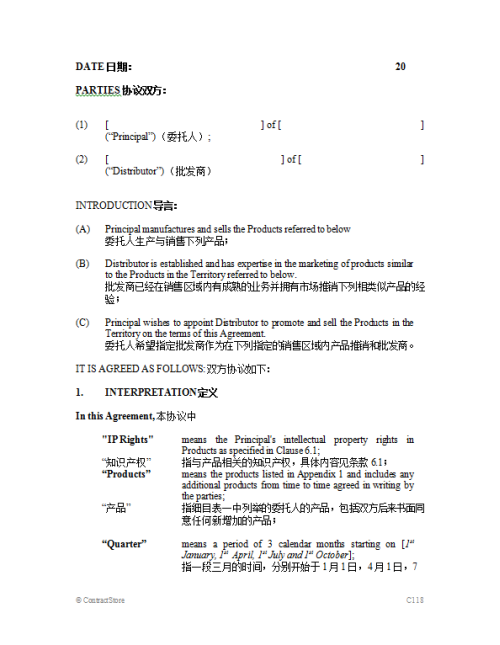 The main purpose of clause 7.2 is to ensure that the Principal is notified by the Distributor if, for example, counterfeit goods appear in the territory. To the extent that information passing between the Principal and the Distributor is confidential, this clause imposes confidentiality obligations on both parties. Clause 9.1 sets out the grounds on which either party can terminate the Agreement. It is drafted so as to be fairly balanced. It is useful to specify the consequences of termination and these are dealt with in clauses 9.2 to 9.5. Note in particular the provisions of clauses 9.2.2 and 9.5: as currently drafted the Principal’s liability to the Distributor for termination other than as a result of a breach of the Agreement by the Distributor is wide-ranging and includes claims for loss of anticipated profits. This area is likely to be the subject of negotiations between the Principal and Distributor and it is possible that the Principal may wish to impose a cap on its liability. Local legal advice should be taken as to the rights of each party on termination and the effectiveness of any cap or limitation of liability. See Document A117 for an example of an agreement which favours the Principal upon termination. 10.1 Assignment. The relationship is one which would not normally be assignable and an express prohibition on assignment is included subject to the other party’s written agreement. 10.2 Sub-contracting. This is drafted so as to make it clear that the Distributor has the right to subcontract its role to others but must notify the Principal. 10.3 Notices. This is a mechanism for giving formal notices under the Agreement and is usually advisable. 10.5 Entire Agreement. Quite often a distributorship agreement is only entered into after a course of dealings and/or an exchange of letters. The purpose of this clause is to make it clear that the Agreement replaces those earlier arrangements. Each party should ensure that the Agreement is signed by a director or other duly authorised officer. The signing clause assumes that each signature will be witnessed by a third party. In a cluttered online contracts market, I am very pleased that I have downloaded what I needed from ContractStore. The process was excellent from start to finish. The quality of the templates are very good and the clarity with which they explain the content prior to purchase is outstanding. I actually downloaded the wrong template (entirely my fault), after which, they refunded me my fee and I was able to buy the right one. I highly recommend this service to any small business owner.